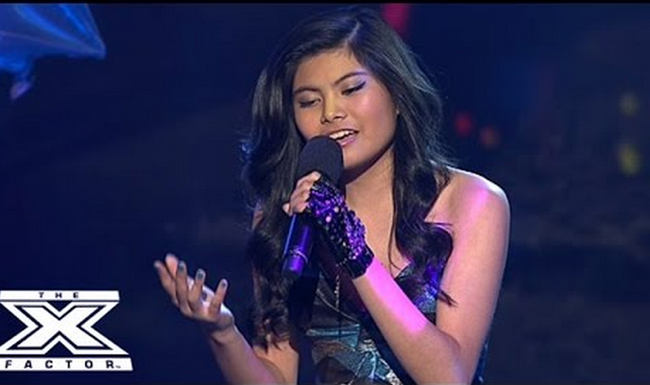 Marlisa Punzalan, a 14 year old Filipina, wowed the audience and judges of X factor Australia with her rendition of Hopelessly Devoted to You, hit song of Olivia Newton-John, last Sunday, August 24,2014. She got in as one of the top 10 finalist and made the Filipinos proud of her. The week’s performance, as a part of the theme ‘Decade Challenge’, made Ronan Keating, Dannii Minogue, Redfoo, and Natalie Bassingthwaighte, the four judges of the prestigious talent search, stand and cheer for her. Bassingthwaighte thought that this is Marlisa’s comeback since she lost her voice last week. Marlisa admitted that she had a hard time last week. As noticed in her “Paparazzi” rendition, she struggled to reach the right notes and Keating seemed uncomfortable but hopeful about the performance. Nevertheless, she still received positive feedback. Keating is her mentor as she belonged to the group ‘ Under 25 Females’. He voiced out his thought that Marlisa would be a big star and would be able to sell records not just locally, but internationally as well. Marlisa auditioned in the X Factor Australia with the song Yesterday by The Beatles. Keating said that he hadn’t been moved in such a way for the last five years. She admitted that she is a shy person, but inside her is a unbelievable talent. Redfoo even said that she has the biggest voice for a girl at the age of 14. Filipinos are openly supporting the young Pinay as she sings on the stage as one of the top 10.